مرادی نسب, شیدا, بلیانی, سحر, بهزاد, مهدی, تمدن, فاطمه. (1395). حذف رنگ‌های راکتیو از پساب‌های نساجی با استفاده از کربن فعال حاصل از پسماندهای دانه کنجد روکش‌شده با پلی‌وینیل‌الکل. مجله آب و فاضلاب, 27(4), 84-92. شیدا مرادی نسب; سحر بلیانی; مهدی بهزاد; فاطمه تمدن. "حذف رنگ‌های راکتیو از پساب‌های نساجی با استفاده از کربن فعال حاصل از پسماندهای دانه کنجد روکش‌شده با پلی‌وینیل‌الکل". مجله آب و فاضلاب, 27, 4, 1395, 84-92. مرادی نسب, شیدا, بلیانی, سحر, بهزاد, مهدی, تمدن, فاطمه. (1395). 'حذف رنگ‌های راکتیو از پساب‌های نساجی با استفاده از کربن فعال حاصل از پسماندهای دانه کنجد روکش‌شده با پلی‌وینیل‌الکل', مجله آب و فاضلاب, 27(4), pp. 84-92. مرادی نسب, شیدا, بلیانی, سحر, بهزاد, مهدی, تمدن, فاطمه. حذف رنگ‌های راکتیو از پساب‌های نساجی با استفاده از کربن فعال حاصل از پسماندهای دانه کنجد روکش‌شده با پلی‌وینیل‌الکل. مجله آب و فاضلاب, 1395; 27(4): 84-92. در این پژوهش، خواص جذبی کربن فعال تهیه شده از پسماند حاصل از دانه‌های روغن‌کشی شده کنجد که با پلی‌وینیل‌الکل روکش شده‌ بودند، برای حذف رنگ‌های راکتیو قرمز 198 و آبی 19 از پساب صنایع نساجی مطالعه شد. مجموعه فرایند برای تعیین تعدادی از فاکتورهای مؤثر در ظرفیت جذبی پلی‌وینیل‌الکل مورد استفاده قرار گرفت و تأثیر pH، مقدار جاذب، زمان تماس و غلظت اولیه رنگ بررسی شد. همچنین ایزوترم‌های جذبی و سینتیکی واکنش مطالعه شد. در این پژوهش بالاترین حذف رنگ در pH برابر ۳ به‌دست آمد. بازده حذف رنگ از پساب همراه با افزایش زمان تماس برای هر دو رنگ تا 90 دقیقه افزایش یافت. سینتیک جذب رنگ‌های آبی و قرمز از مدل شبه ‌درجه دوم تبعیت کرد. غلظت رنگ‌های آبی و قرمز در پساب به‌روش اسپکتروفتومتری به‌ترتیب در طول موج‌های 590 و 517 نانومتر اندازه‌گیری شد. مجموعه نتایج نشان داد که پلی‌وینیل‌الکل قابلیت خوبی در جذب رنگ دارد و می‌توان از آن به‌عنوان یک جاذب مؤثر، ارزان‌قیمت و در ‌دسترس برای تصفیه پساب صنایع نساجی استفاده کرد. In this study, the adsorption of active carbon derived from waste sesame seeds coated with polyvinyl alcohol (AC/PVA) was investigated for removing red 198 and blue 19 reactive dyes from textile effluents. The batch process was carried out to identify such parameters as pH, adsorbent dose, contact time, and initial dye concentration involved in the dye removal adsorption capacity of AC/PVA. Also, batch kinetic and isotherm experiments were conducted. Results indicated that the maximum dye removal was obtained in an acidic pH over 90 min of contact time and that adsorption rates followed the pseudo-second-order kinetics. Blue and red dye concentrations were determined using the spectrophotometric method at 590 and 517 nm, respectively. It may be concluded that AC/PVA is capable of removing blue and red reactive dyes and can be used as an efficient, cheap, and accessible adsorbent for treating textile effluents. Gupta, V., and Suhas, K. (2009). “Application of low-cost adsorbents for dye removal–A review.” J. of Environ. Manag., 90(8), 2313-2342. J. of Environ. Int., 30(7), 953-971. Robinson, T., McMullan, G., Marchant, R., and Nigam, P. (2001). “Remediation of dyes in textile effluent: a critical review on current treatment technologies with a proposed alternative.” J. of Bioresource. Technol., 77(3), 247-255. Kannan, C., Muthuraja, K.R., and Devi, M. (2013). “Hazardous dyes removal from aqueous solution over mesoporous aluminophosphate with textural porosity by adsorption.” J. of Hazard. Mater., 244-245, 10-20. Rajeshwari, S., Namasivayam, C., and Kadirvelu, K. (2001). “Orange peel as an adsorbent in the removal of acid violet 17 (Acid Dye) from aqueous solution.” J. of Waste. Manage, 21(1), 105-110. Rajkumar, D., and Kim, J.G. (2006). “Oxidation of various reactive dyes with in situ electro-generated active chlorine for textile dyeing industry wastewater treatment.” J. of Hazard. Mater., 136(2), 203-212. Wan Ngah, W.S., Teong, L.C., and Mhanafiah, A.K.M. (2011). “Adsorption of dyes and heavy metal ions by chitosan composites: A review.” J. of Carbohyd. Polym., 83(4), 1446-1456. Mohd Salleh, M.A., Khalid Mahmoud, D., Wan Abdul Karim, W.A., and Idris, A. (2011). “Cationic and anionic dye adsorption by agricultural solid wastes: A comprehensive review.” J. of Desalination. 280(1/3), 1-13. A review.” J. of Chem. Eng., 219, 109-117. 10. Zhang, S.J., Yu, H.Q., and Feng, H.M. (2006). “PVA-based activated carbon fibers with lotus root-like axially porous structure.” J. of Carbon, 44 (10), 2059-2068. 11. Malik, P.K. (2004). “Dye removal from wastewater using activated carbon developed from sawdust: adsorption equilibrium and kinetics.” J. of Hazard. Mater., 113 (1/3), 81-88. 12. 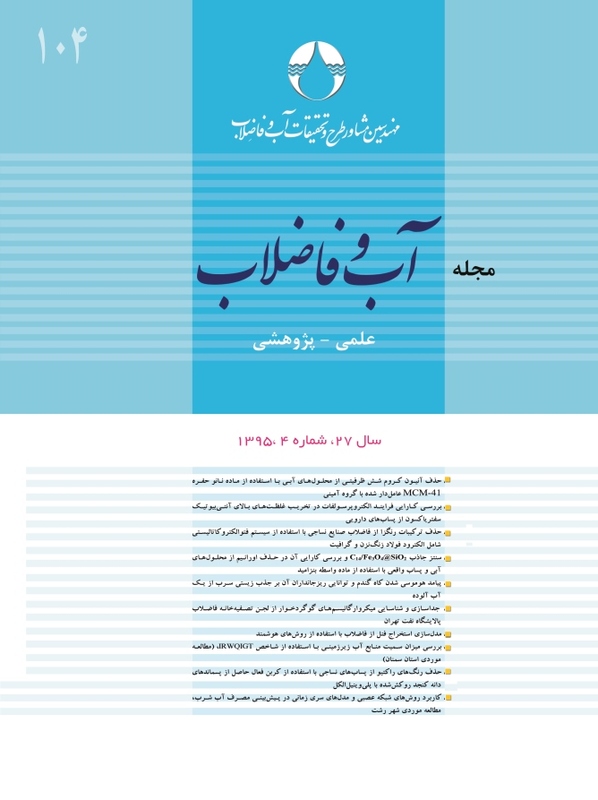 Farahani, M., Sheikh Abdullah, S.R., Hosseini, S., Shojaeipour, S., and Kashisaz, M. (2011). “Adsorption-based cationic dyes using the carbon active sugarcane bagasse.” J. of Procedia. Environ. Sci., 10, 203-208. 13. Li Wen, H., Yue, Q.Y., Gao, B.Y., Wang, X.J., Qi, Y.F., Zhao, Y.Q., and Li, Y.J. (2011). “Preparation of sludge-based activated carbon made from paper mill sewage sludge by steam activation for dye wastewater treatment.” J. of Desalination, 278(1/3), 179-185. 14. Mezohegyi, G.P., Van Der Zee, F., Font, J., Fortuny, A., and Fabregat, A. (2012). “Towards advanced aqueous dye removal processes: A short review on the versatile role of activated carbon.” J. of Environ. Manage, 102, 148-164. 15. Mahmoodi, N.M., Salehi, R., and Arami, M. (2011). “Binary system dye removal from colored textile wastewater using activated carbon: Kinetic and isotherm studies.” J. of Desalination, 272(1/3), 187-195. 17. Gehlot, P., Daga, K., and Mehta, R. (2011). “Adsorption study of water using Poly Vinyl Alcohol coated carbon black as an effective and low cost adsorbent.” Inter. J. Chem., 3(1916/9698), 1916-9701. 19. Sandeman, S.R., Gunko, V.M., Bakalinska, O.M., Howell, C.A., Zheng, Y., Kartel, M.T., Phillips, G.J., and Mikhalovsky, S.V. (2011). “Adsorption of anionic and cationic dyes by activated carbons, PVA hydrogels, and PVA/AC composite.” J. of Colloid Interface Sci., 358, 582-592. 20. Moussavi, Gh., and Mahmoudi, M. (2009). “Removal of azo and anthraquinone reactive dyes from industrial wastewaters using MgO.” J. of Hazard. Mater., 168, 806-812. 21. Guyen, K.N., Thi, T.H.P., Lam, T.D., and Tran, Q.H. (2013). “A facile synthesis of nanostructured magnesium oxide particles for enhanced adsoption performance in reactive blue 19 removal.” J. of Coloid. Interface. Sci., 398, 210-216. 22. Jiang, X., Yongmei, S, Liu, L., Wang, and Tian, X. (2013) “Adsorption of C.I. reactive blue 19 from aqueous solutions by porous particles of the grafted chitosan.” J. of Chem. Eng., 235, 151-157. 23. Osman, G., Sahmurova, A., and Kama, S. (2011) “Removal of Reactive Red 198 from aqueous solution byPotamogeton crispus.” J. of Chem. Eng., 174, 579-585. 24. Elkady, M.F., Lbrahim, A.M., and Abd El-latif, M.M. (2011) “Assessment of the adsorption kinetics, equilibrium and thermodynamic for the potential removal of reactive red dye using eggshell biocomposite beads.” J. of Desalination, 278, 412-423.